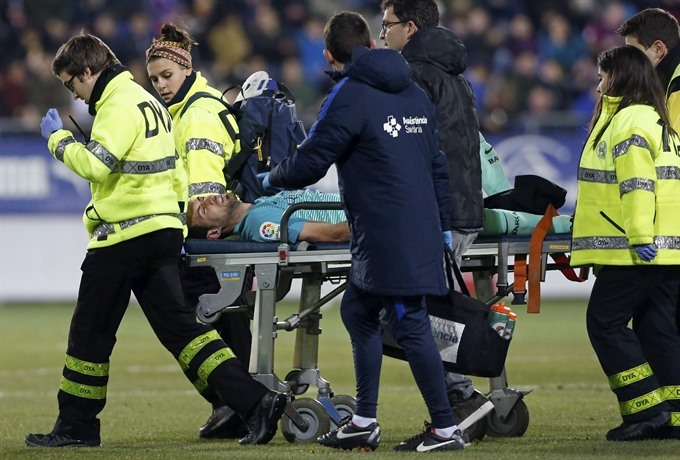 MADRID – Barcelona midfielder Sergio Busquets had to be stretchered off just eight minutes into the Catalans’ 4-0 win at Eibar on Sunday with sprained ligaments in his right ankle. "Busquets has a sprained external lateral ligament in his right ankle. Tomorrow he will have more tests," Barca’s official Twitter account confirmed. The Spanish international’s ankle was trapped under the weight of Gonzalo Escalante’s studs as the Argentine was fortunate to escape without even being shown a yellow card. However, Barca boss Luis Enrique is relieved that the injury is not as serious as first feared. "The good news about Sergio Busquets is that it doesn’t look as serious as we first thought," he told Spanish TV station Movistar. Denis Suarez replaced Busquets and went on to open the scoring with his first Barca goal. Barca’s fearsome front three of Lionel Messi, Luis Suarez and Neymar all then netted in the second-half to round off the scoring. However, of greater concern may be Busquets’s availability for a busy few months ahead for the Spanish champions. On top of their La Liga commitments, Barca host Real Sociedad in the second leg of their Copa del Rey quarter-final on Thursday and return to Champions League action when they travel to Paris Saint-Germain on February 14. "I have a lot of players and a lot of players I can rely on. They are all internationals and all have a lot of quality," added Enrique.